As I perused today's Wall Street Journal, I learned that vacations are making a comeback, per a survey conducted by the US Tour Operators Association. I also learned that in 2009, the top domestic destination for tour- and package-type travelers was New York City. I have no desire to travel to New York City. As you may know, my destination happiness normally revolves around beaches and/or golf carts. I'm not likely to find those in NYC. My travel happiness often involves peace and quiet and non-urban hiking. Again, don't think so. If you're of the "don't knock it before you try it" camp, be assured that I have spent the better part of a whole day in the Big Apple during a high school youth group trip. We took a ferry to see the Statue of Liberty. I took photos of the World Trade Center. I have slides (remember those?) to prove it. But sorry, no desire to return. I'm just not a shows-restaurant-urban girl. On the other hand, the top international destination for 2009 was Italy. 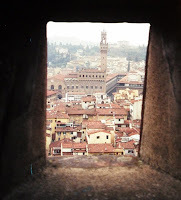 And despite a lack of golf carts and beaches in Florence, Italy, a friend and I did visit earlier this decade. Maybe the little cars reminded me of golf carts. Maybe the unseasonably warm March weather made it feel tropical. Maybe it was just cool and full of history. To Italy, I would return.